Several people asked about the new header. 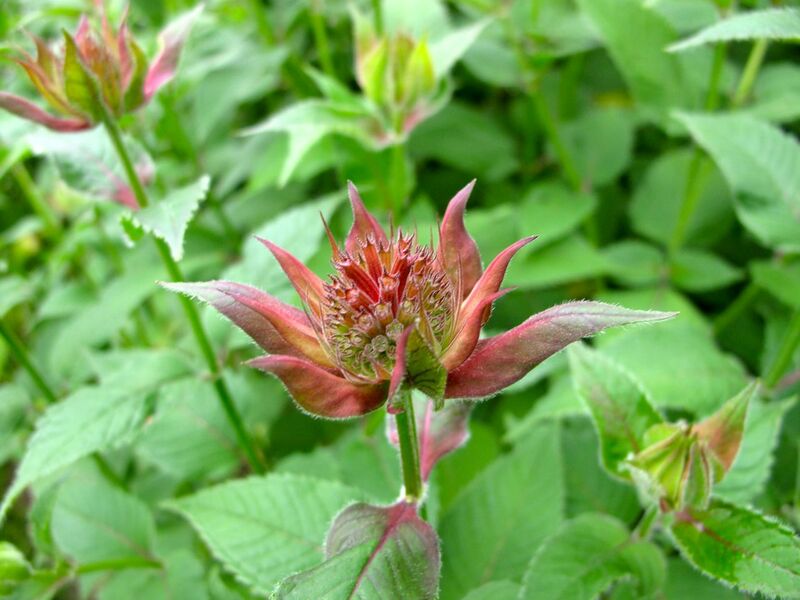 It shows the first flower in a large stand of native Monarda didyma (Scarlet bee balm). Even in early winter I could notice its minty aroma. Hummingbirds have already been visiting the garden. They should become more frequent as Monarda continues to open. 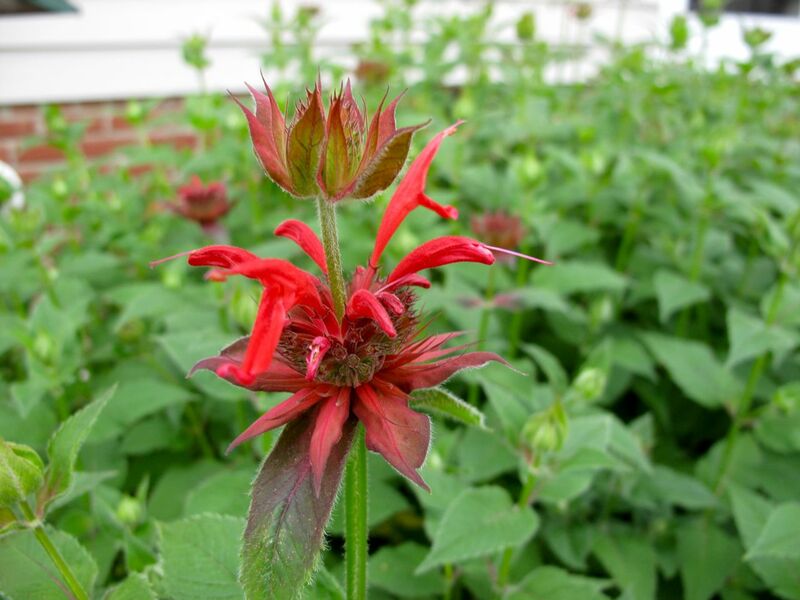 This entry was posted in garden and tagged Monarda didyma (Scarlet bee balm) on June 5, 2015 by pbmgarden. One of my very favorite native plants especially for the hummers and butterflies who visit…lovely Susie as is your new header! Thanks Donna. I hope to see more butterflies this year! 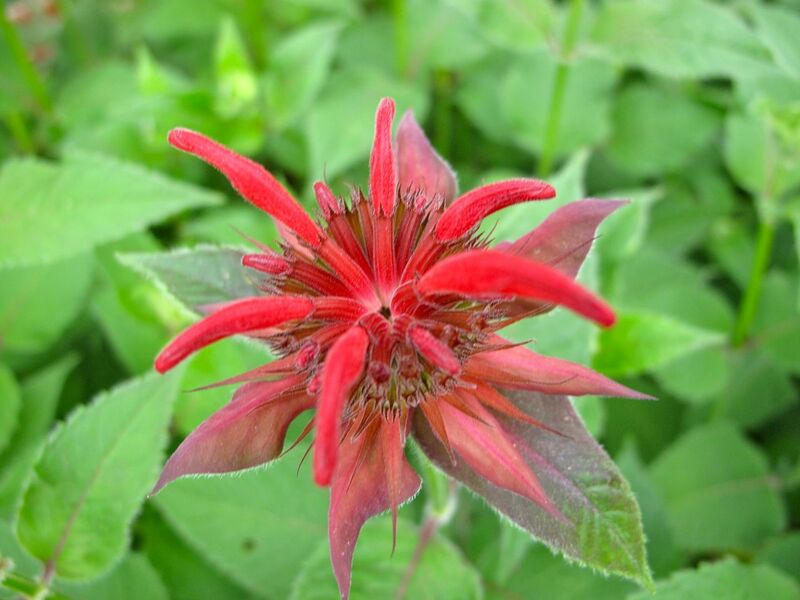 Recently I have seen newer colors that are nice but I don’t need more beebalm, so will stick to scarlet. I’ve not grown monarda for many years because I had read it was so invasive. Have you had that problem with yours? It is indeed a beautiful plant. It’s easy to pull out. Mine is in a contained border and it has taken over quite a large portion of it. I also have columbine there which does the same thing! But first the columbine blooms and as it finishes the beebalm shoots up and takes over. Powdery mildew is a problem. I do not have any ‘yet’ but added it to my bucket list. 🙂 Beautiful. 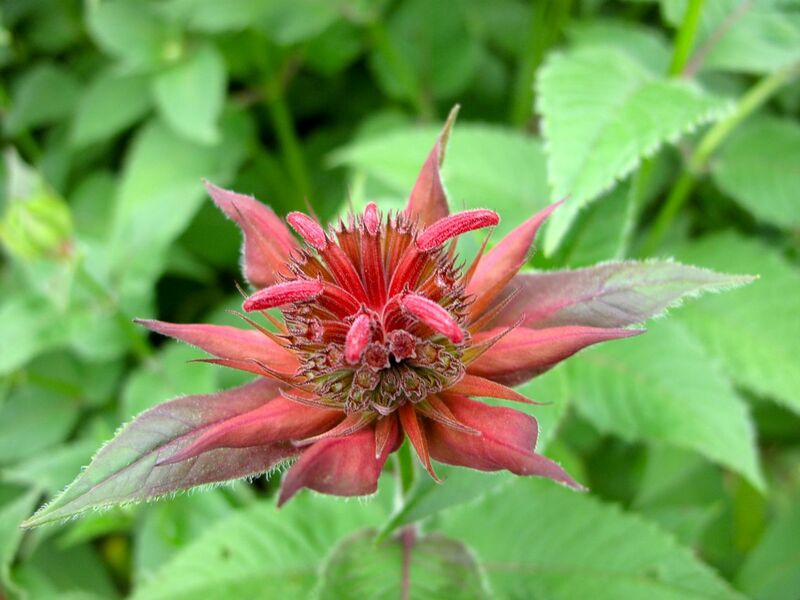 Beebalm’s easy to grow here and brings great pleasure. Hope you’ll get a chance to try it sometime Judy. Beautiful – the first time I ever saw it was in a nearby botanic garden and I was smitten. The buzzing of thousands of bees around it was what first alerted me to it….and then scent – just lovely! Hi Matt. I hope the bees will enjoy this monad–I’ve seen more around the garden this year over last year. The scent is refreshing. It is a lovely flower and I do like the smell too. I think it’s just too dry in my garden as I have tried to grow it but it just succumbs to mildew every year. Yours looks so healthy Susie! Hope you get lots of beautiful creatures attracted to it! That is one fascinating flower…and red! So pretty, I didn’ t recognise the bud as a Monarda. Mildew can be a problem can’ t it? Yes, and already I’m seeing mildew on Verbena Bonariensis. There’s been scarcely any rain so it must be from the small amount of hand-watering I’ve done. Beautiful closeups of a beautiful plant. I wish the foliage didn’t go downhill so rapidly after blooming, my hot dry yard does not help with this at all…. Thank you. You’re right about the foliage. Really lovely color. Monarda is very invasive in my garden and I have to pull many of them out. I would call Monarda very aggressive in my garden. It spreads a lot, but it’s pretty easy to pull out when it strays too far. I’ve allowed it to take over more than is probably reasonable, but it keeps me from having to plant anything else there and hummingbirds and bees are so happy with it.